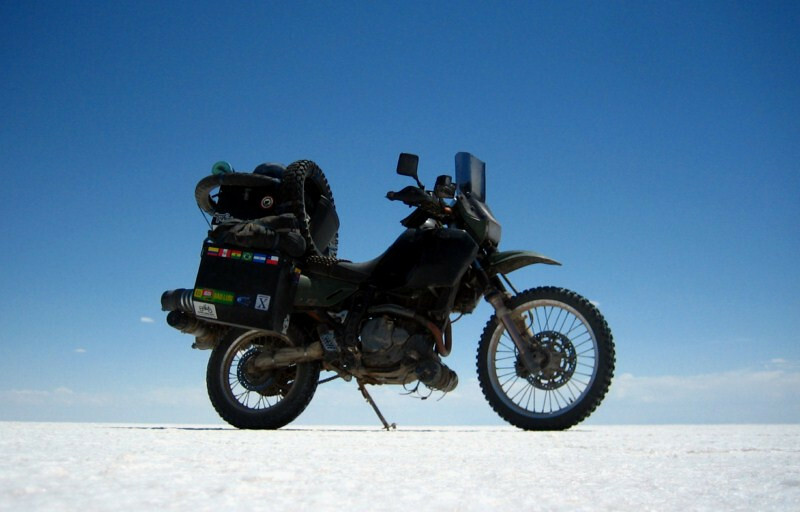 Here’s a video from my trippy ride across the world’s largest salt flat, Salar de Uyuni in remote southwestern Bolivia, at an altitude of 3,656 meters (12,000 ft). 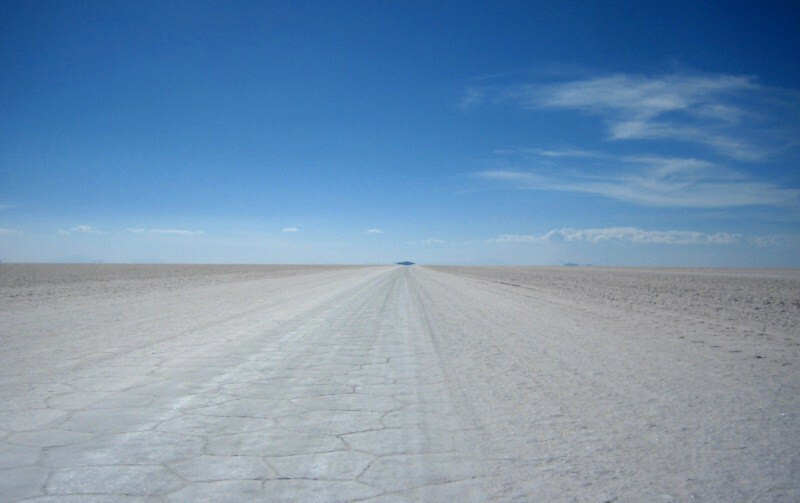 The one place I really wanted to experience in South America was the Salar de Uyuni and thus I made a big detour from southern Brazil to come back to Bolivia before heading south. The timing didn’t work out on the first attempt when I came down from the north and I told myself I had to return before leaving this continent. Expectations were high and they were surpassed. 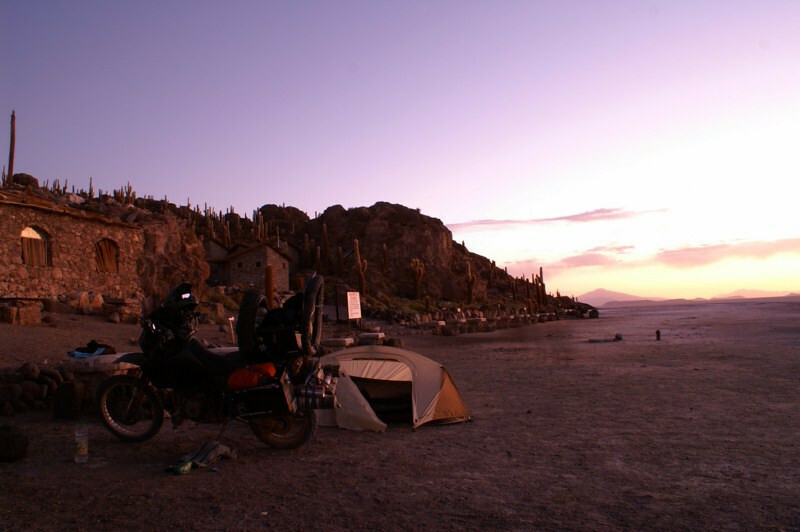 I had a good sleep in Atocha, about a 100 kms (62 mi) south of Uyuni and was excited for today as it was finally the day I would get to experience the Salar de Uyuni. 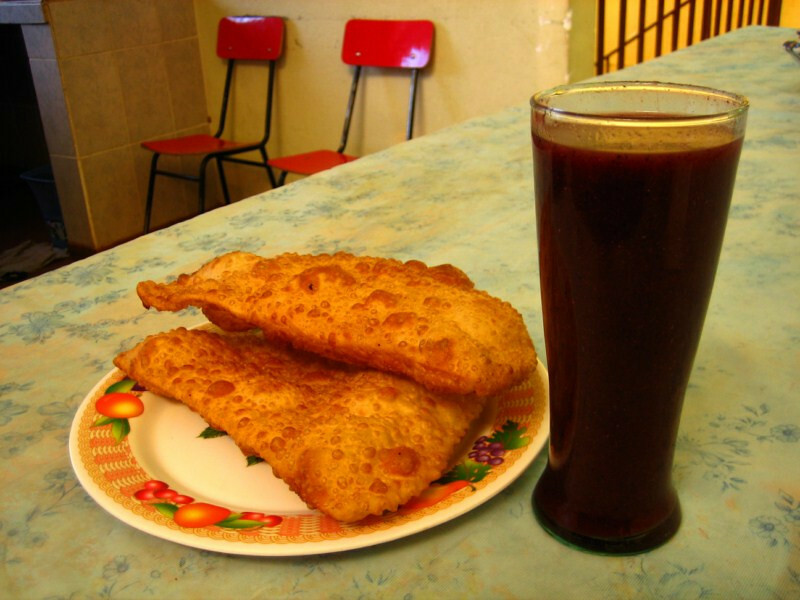 Having a typical breakfast at the mercado of a big glass of api and some fried bread. 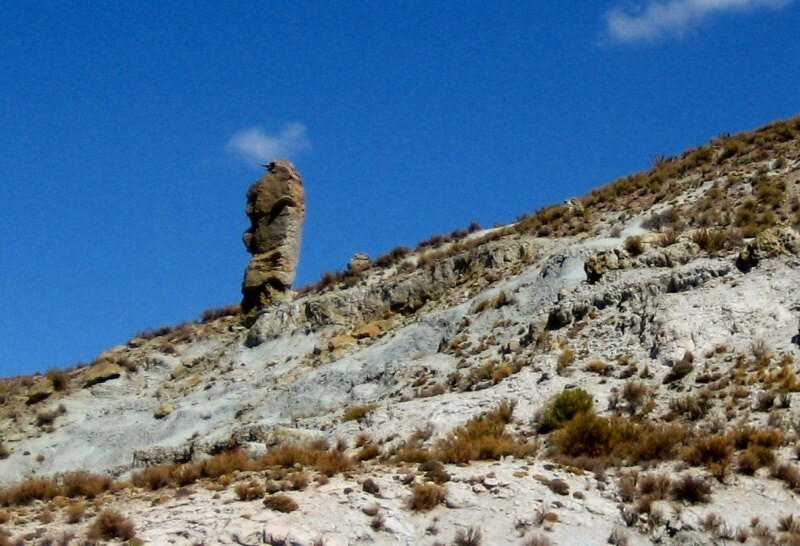 The interesting geology started right outside town. Note the change in the color of the road as I crossed from one mountain to another. Rocks of varying colors on display on this mountainside. The assortment of colors splashed on the landscape were a feast for the eyes. It makes one wonder how a stone pillar like this can remain standing on a steep hill where the wind blows with sand grains in it. The route followed this currently dried river bed, but as you can see, there are tracks running right through it. 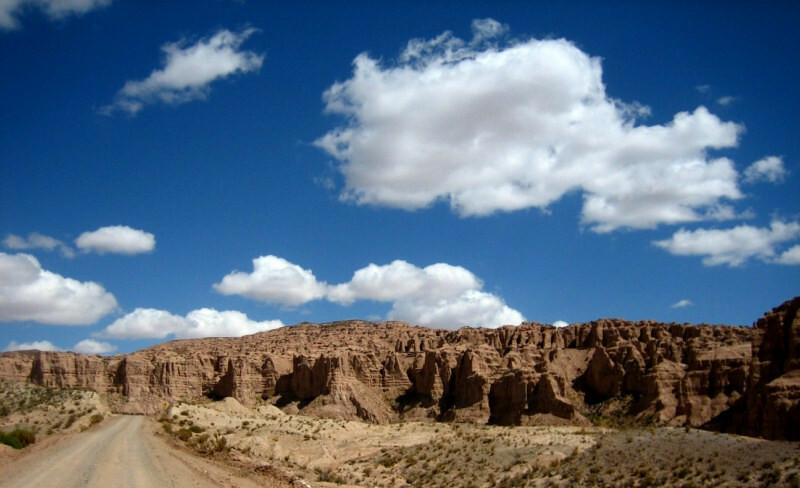 And here’s who’s making them: Land Cruiser 4x4s plying the route between Uyuni and Tupiza. It’s probably a faster route, but with a higher chance of encountering muddy crossings. Entering a canyon of rock towers. The first Red Bull that I’ve taken on this trip. 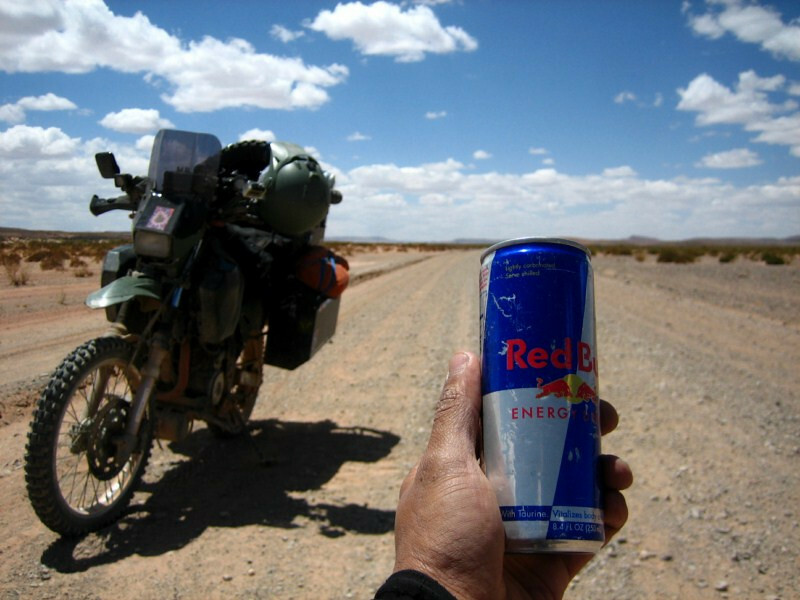 In the US, I was a firm believer in this energy drink and always kept a few handy for those situations where continued attention was needed while riding, like towards the end of a long day. I was carrying this sole can all the way from Chicago and not needing it in the past ten months, I felt it was time to get rid of it and drank it. I really didn’t need it but I was planning to camp out on the Salar tonight and expected temperatures to drop below freezing, where this can would have burst. 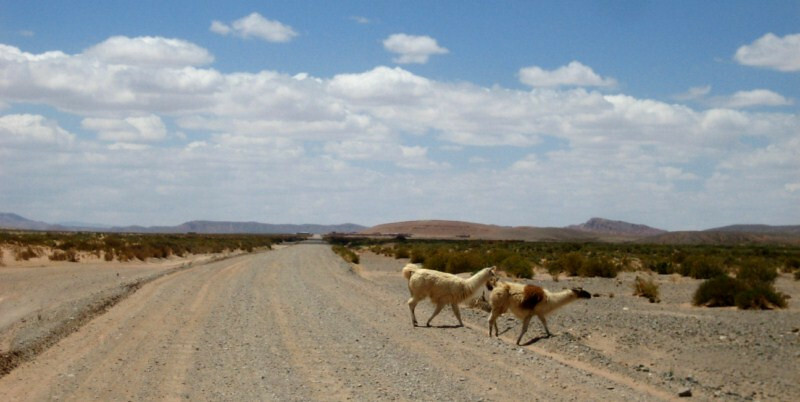 Some tame llamas crossing the corrugated road. 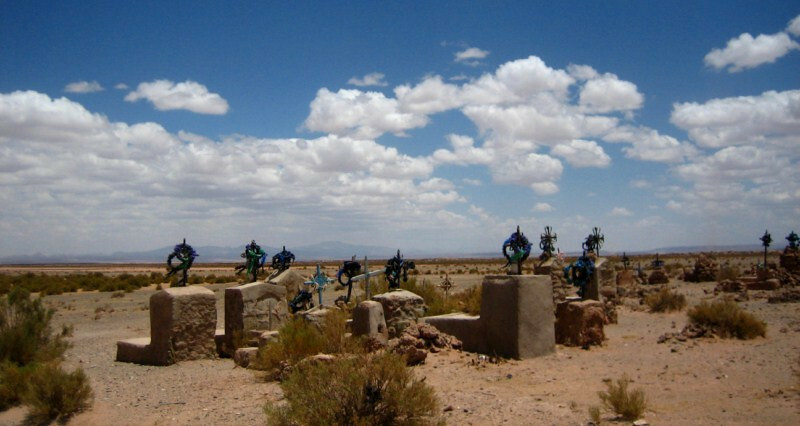 A cemetery out in the middle of nowhere. 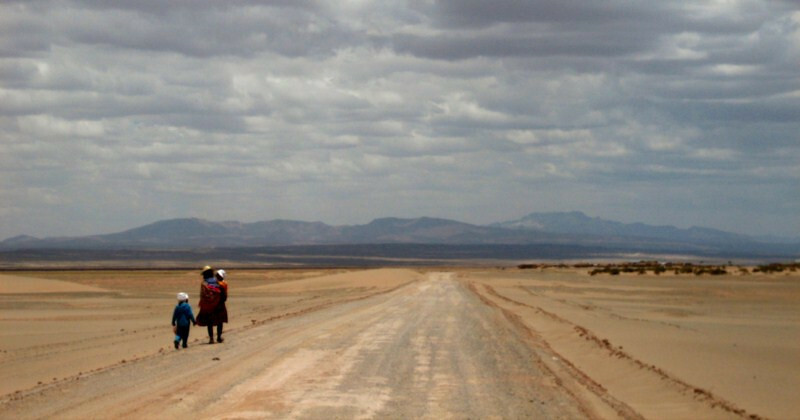 This was a remote area and here was this woman walking to the next town with her children. 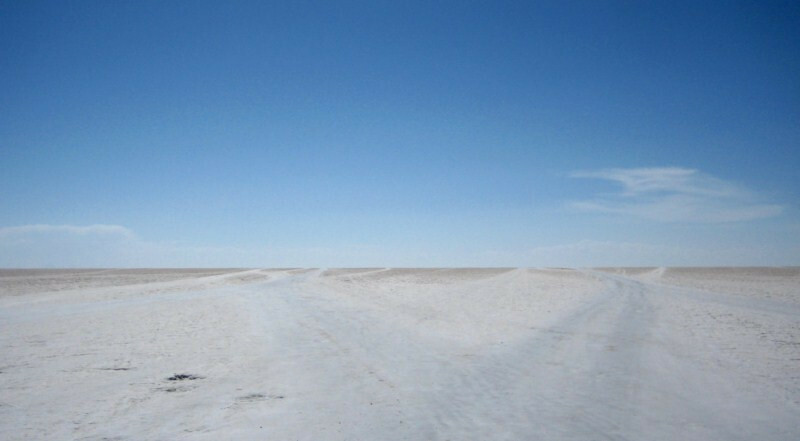 30 kms left to Uyuni. Better than the Red Bull, I resorted to the local stimulant of coca leaves to abate any altitude sickness. The leaves have to be masticated for about 30 minutes first, then the alkaline (ash) agent has to be added, which releases the alkaloids in the leaves. I didn’t feel any rush, but just didn’t get tired. 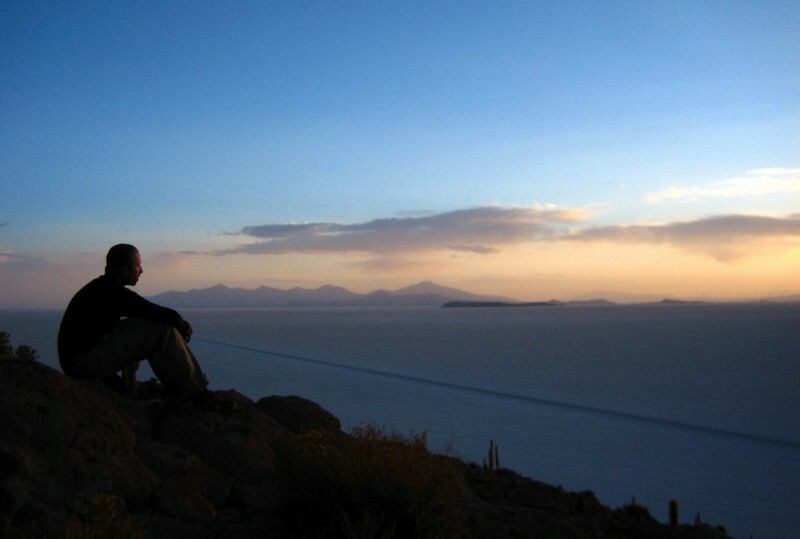 The town of Uyuni slowing coming into view on the horizon. 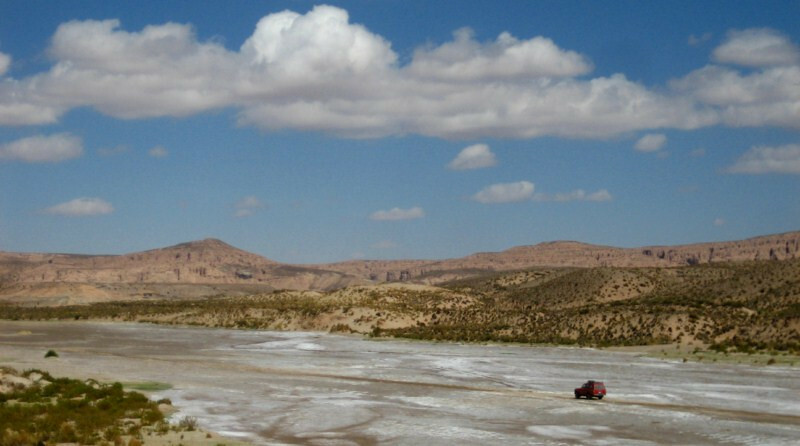 It lies in the middle of a flat expanse and is the hub for tourists heading out into the salar and on the lagunas route via 4x4s. 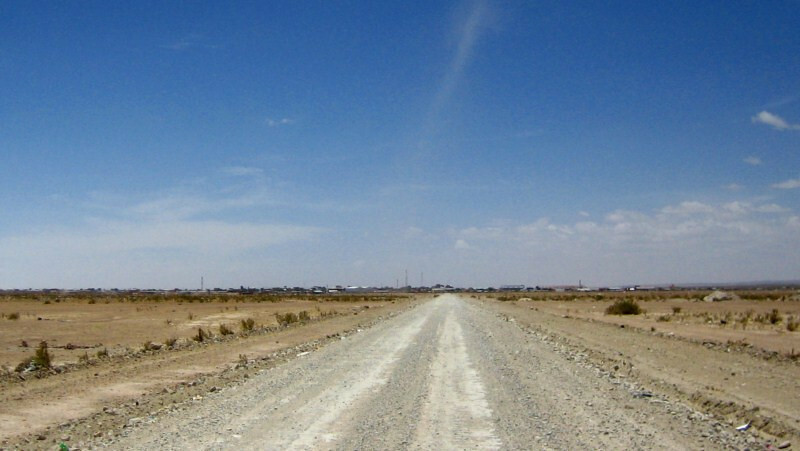 Zero marker for the route from Tupiza to Uyuni. I filled up petrol and topped up my water supplies and headed north. 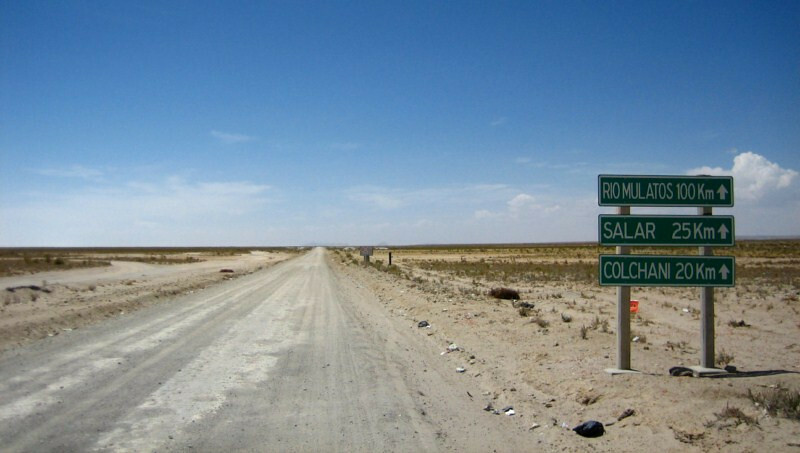 From Uyuni, I headed 20 kms north to the town of Colchani on a heavily corrugated (washboard) road. 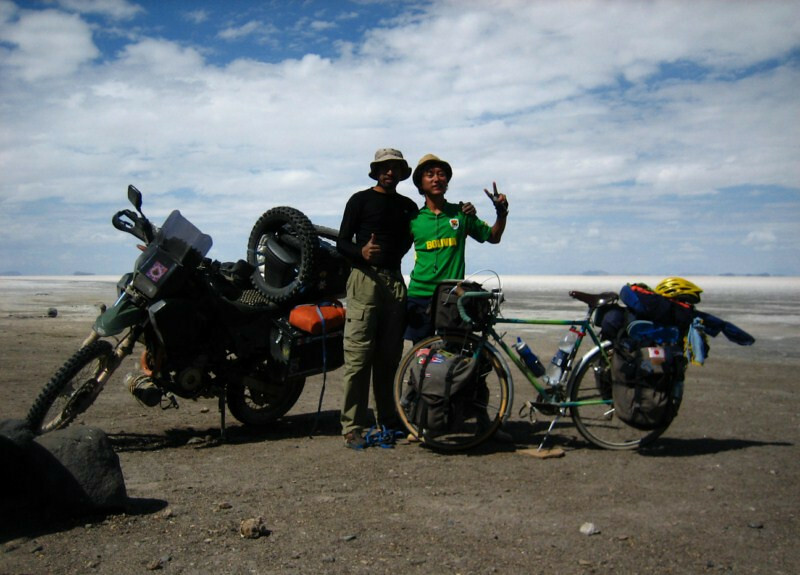 At Colchani, the routes heading into the salar begin. 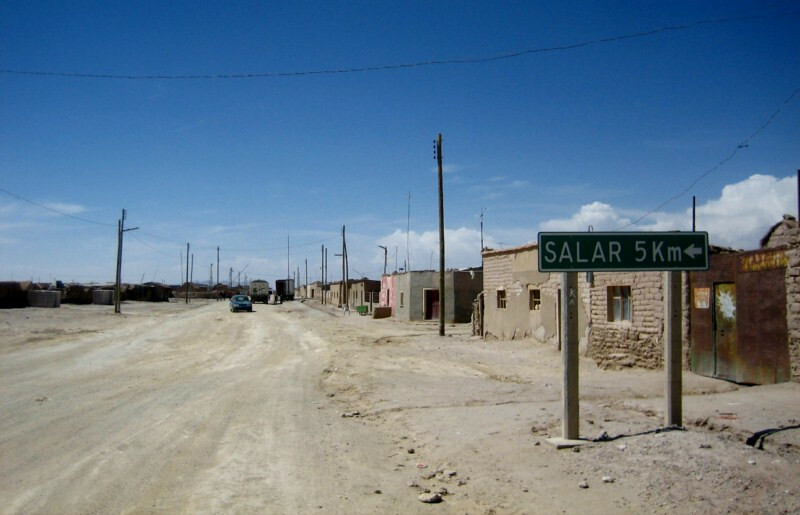 The salar proper begins about 5 kms west of town. 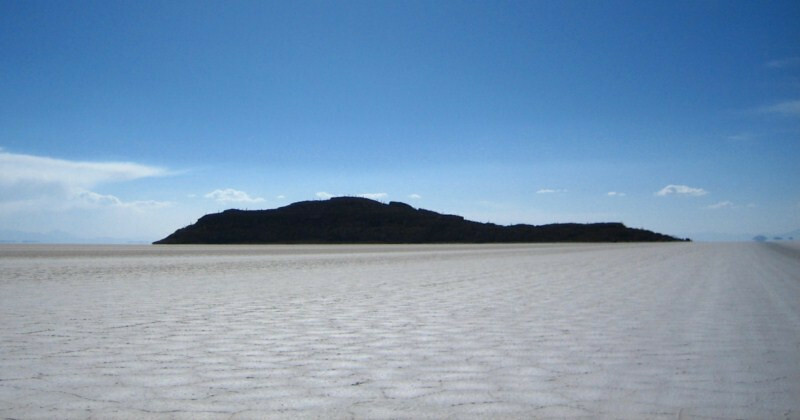 Being a salt flat, salt production is expected and all salt workers on the salar belong to a cooperative at Colchani. 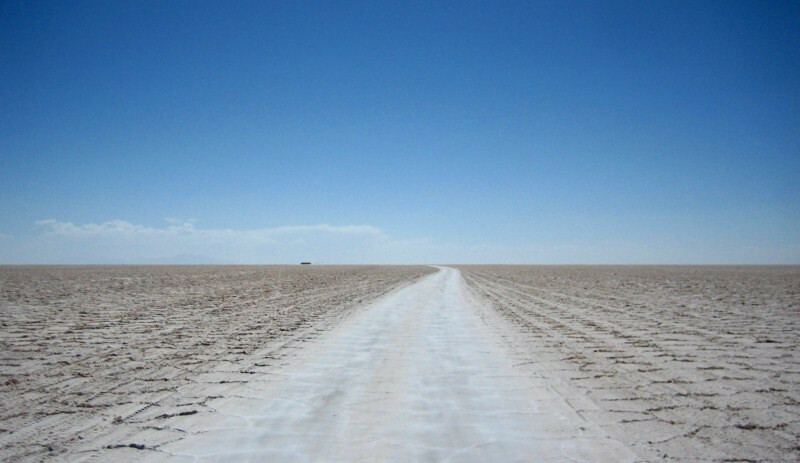 As you ride towards the salar, a broadening band of white grows across the horizon. In the foreground: an abandoned building made with salt bricks. After heading down a few wrong tracks, I was finally on the right track heading to the middle of the salar. It was a bit confusing, since there’s no actual road and multiple tracks head off across the salar. I had GPS maps of the area, but you have to move a certain distance to see if you’re heading in the right direction. The building on the horizon is the salt hotel. 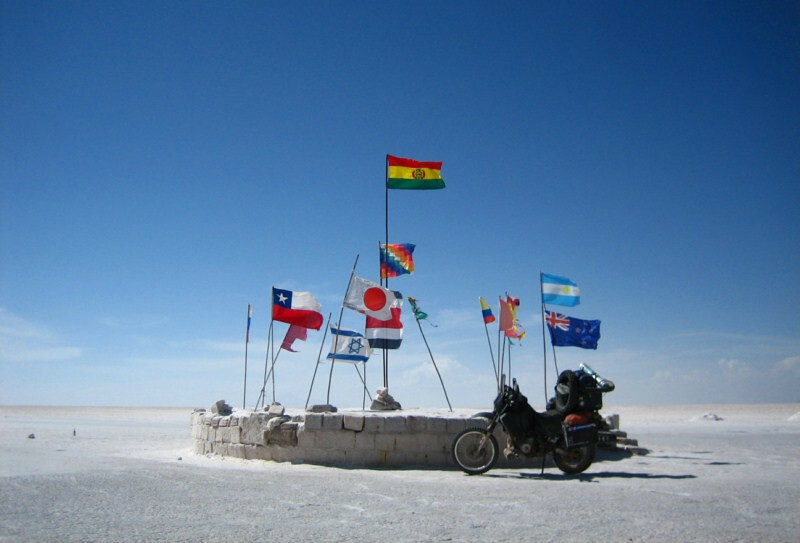 Flags of the world at the only salt hotel on the salar. 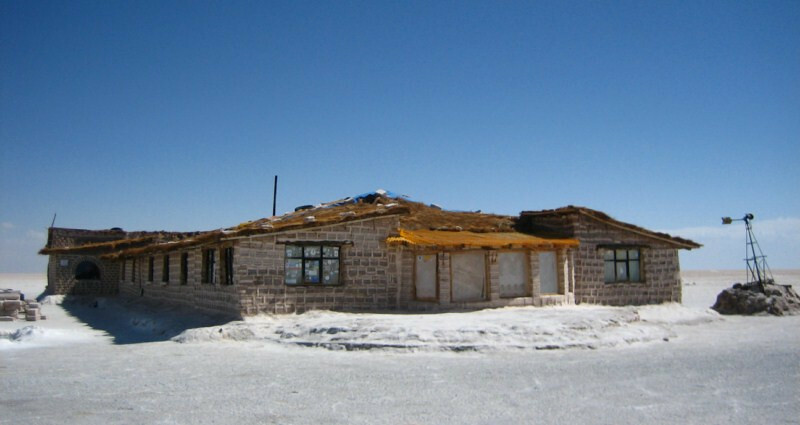 The original salt hotel, which was constructed with bricks cut from the crust of the salar, due to a lack of building supplies at the time and later its construction became a novelty and an attraction in its own right. 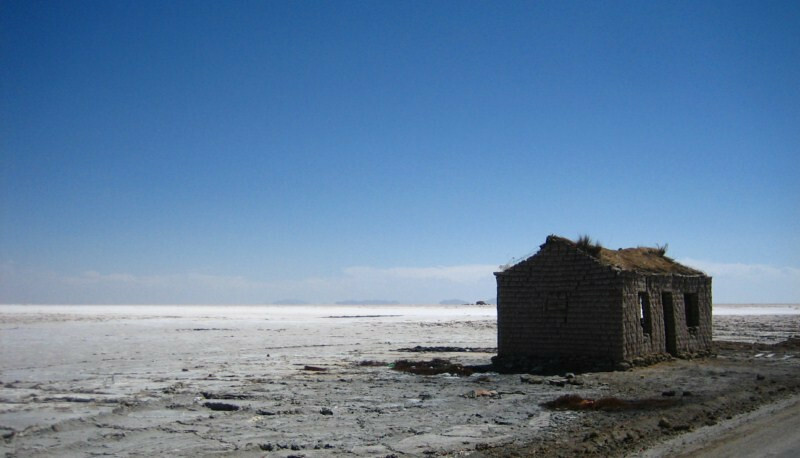 New salt hotels are banned on the salar itself, but exist on the periphery. The confusion of tracks heading out from the salt hotel to Isla Incahuasi. A track starting just a few degrees off can lead you away from the center and to one of the exits. You can generally ride whichever direction you want, but with the rainy season already begun, I was told to be wary of mud off the established tracks. And Ojo de la Sal (eye of the salt), an opening in the crust, reminding you that it’s not solid ground that you’re riding on. 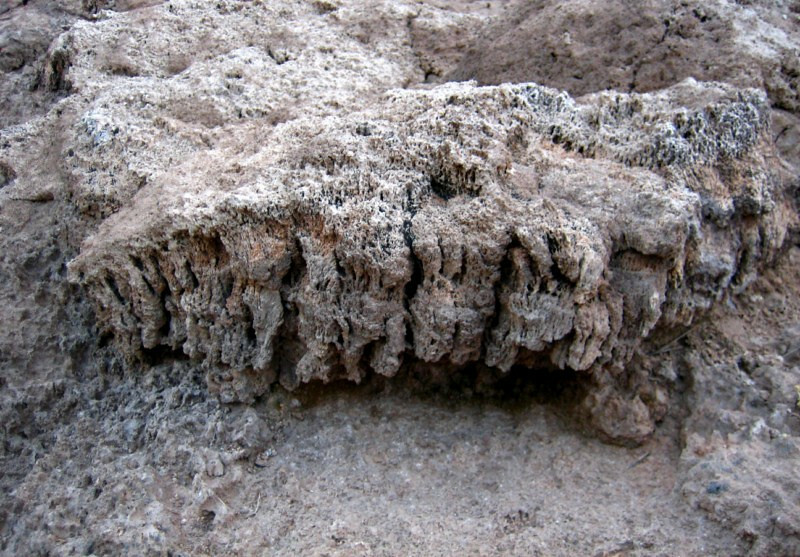 The crust ranges from about a few centimeters to a few meters thick, covering a lake of brine about 20 m (66 ft) deep. 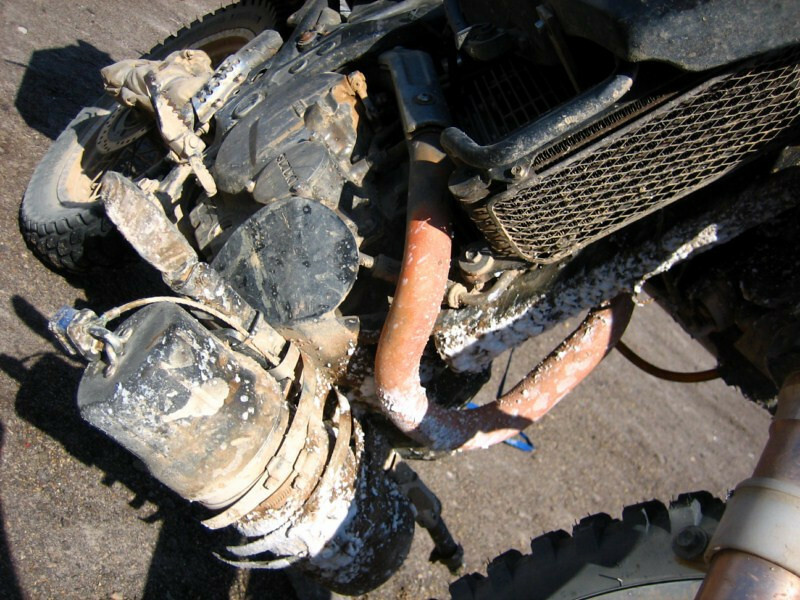 The brine is a solution containing relatively large amounts of different salts: sodium, potassium, lithium and magnesium. 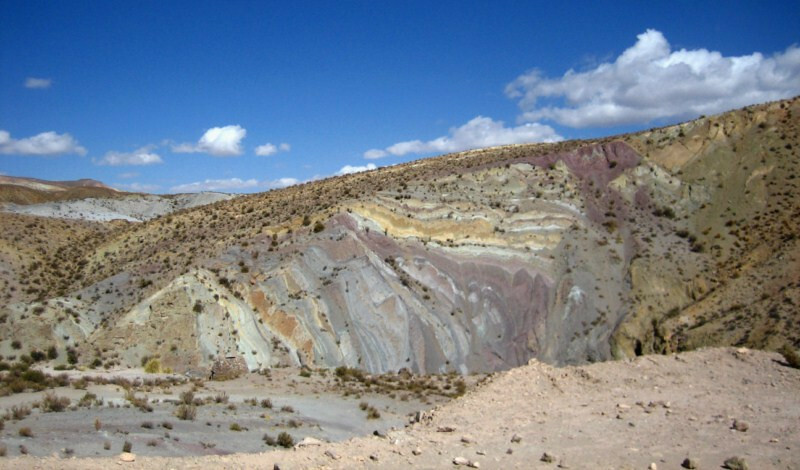 And of those, lithium is the economic gold mine, since Bolivia contains about 50% of the known reserves on this planet. 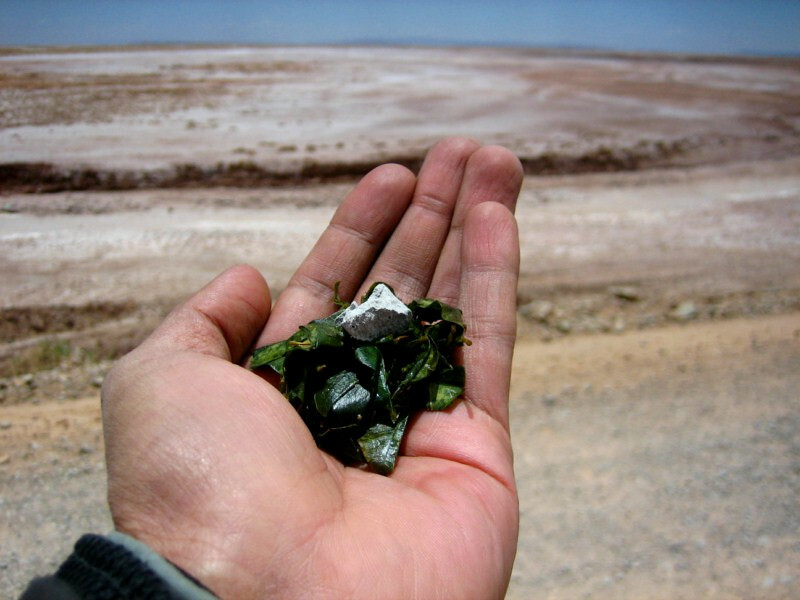 This rare substance is growing in demand due to its use in lithium-ion batteries that power all laptops and most electronics today. 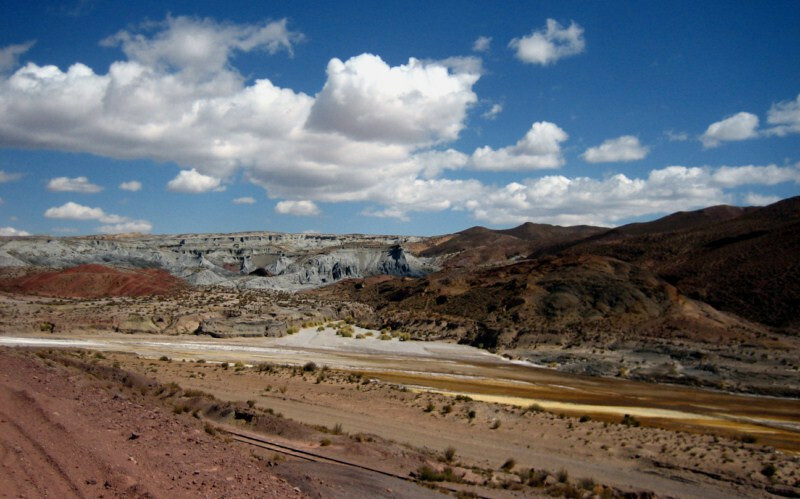 Heading down the direction of electric cars, the demand for lithium is bound to sky rocket and foreign companies are already trying to establish ways of extracting this precious mineral but Evo Morales is taking a cautionary approach to ensure the local population benefits directly. 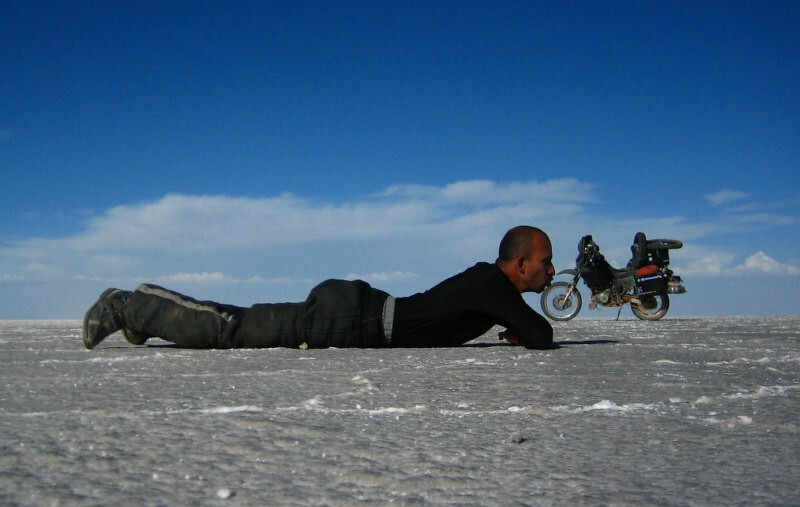 Riding on the salar is a strange and unique experience. 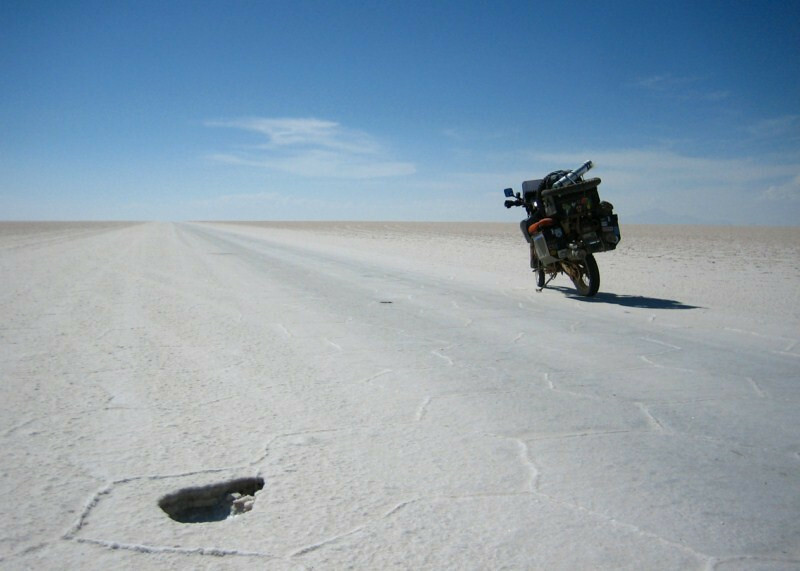 Firstly, the surface is rock hard, almost like concrete and on a well-used path like this, the granules of salt have been pushed aside, making for a smooth ride at high speeds. Secondly, the pentagonal and hexagonal patterns in the crust buzzing underneath you make it the most beautiful surface you’ve ridden on, even having a hypnotizing effect at the right frequency. Thirdly, the lack of any nearby visual reference points make judging distances or speed difficult. That blip on the horizon is Isla Incahuasi, about 30 kms (19 mi) away, which doesn’t seem to get bigger until you get right up to it. Arriving at Isla Incahuasi at the center of the salar. 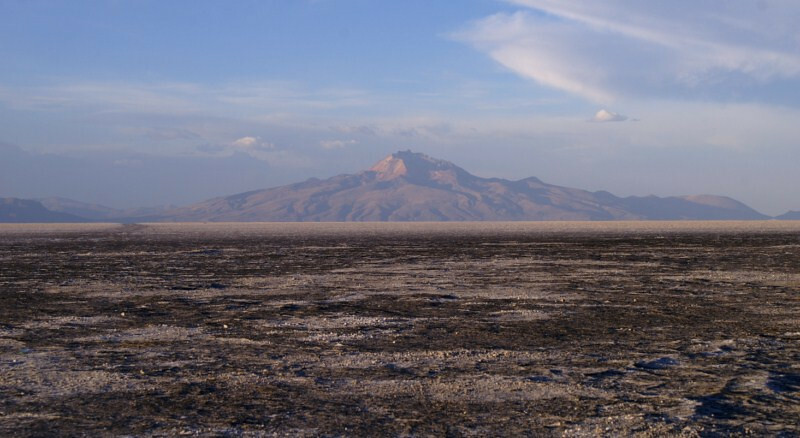 It’s an island in this sea of salt, but is actually the tip of an old volcano that got engulfed when the salar formed about 12,000 years ago. 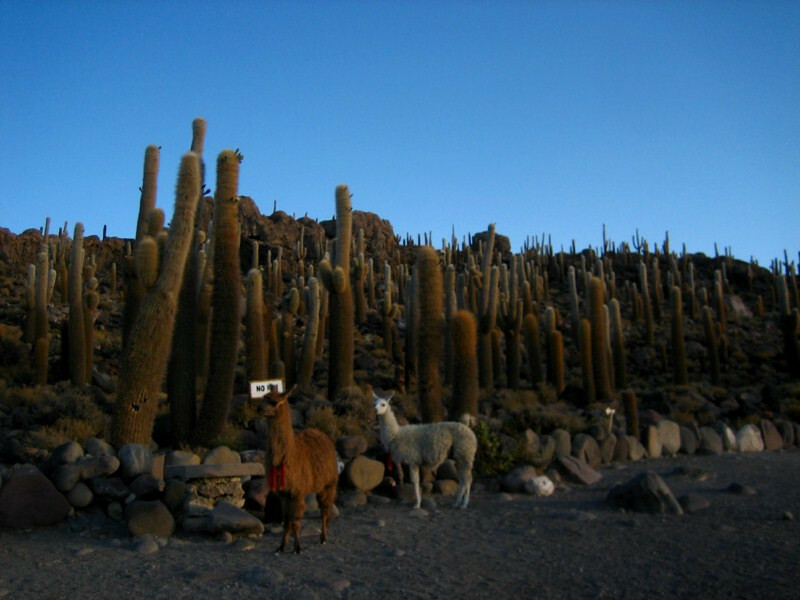 This whole area is part of the Altiplano, a low-relief, high-altitude plateau sandwiched between two primary ridges of the Andes, the Cordillera Occidental to the west and the Cordillera Oriental to the east, making this the widest part of the Andes mountain range. 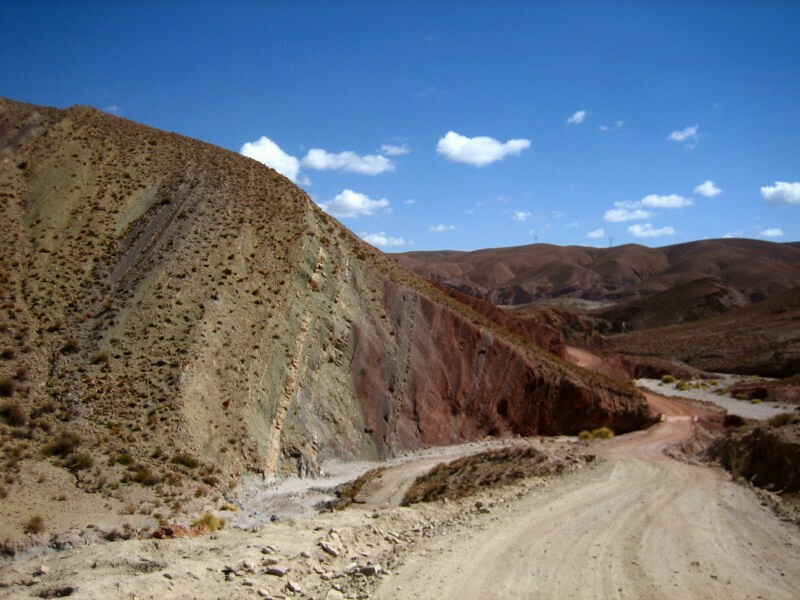 It’s been theorized that when the Andes rose (due to tectonic deformation), prior weaknesses in the Earth’s crust and other factors allowed the altiplano to form. 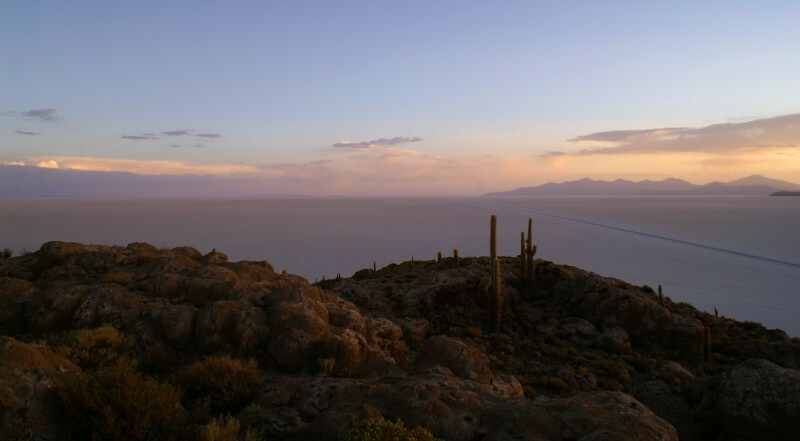 After it formed, there was a massive lake called Ballivián or Michin across the whole altiplano and as it slowly dried, it left behind Lake Titicaca in the north, Lake Poopó further south near Oruro and two salt lakes, Coipasa and Uyuni. 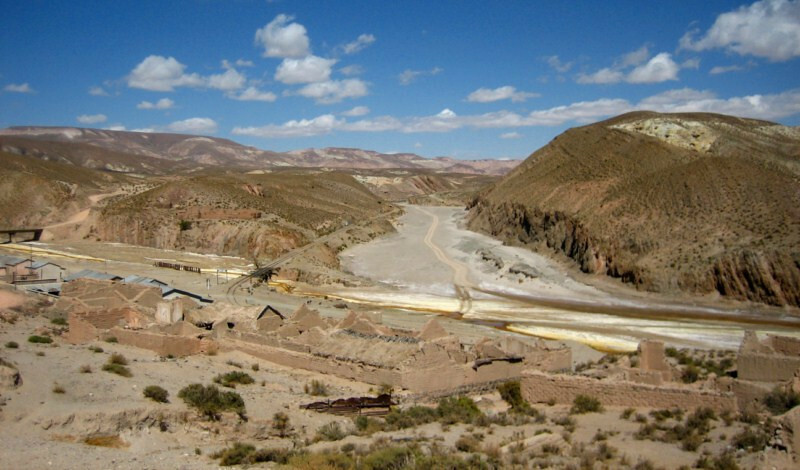 The altiplano is an endorheic zone, meaning rain water doesn’t drain to the sea and the minerals that washed down from the mountains collected as salt in these lakes and their concentrations slowly built up over the ages into the salars of today. She gets a kiss for being such an awesome travel companion. 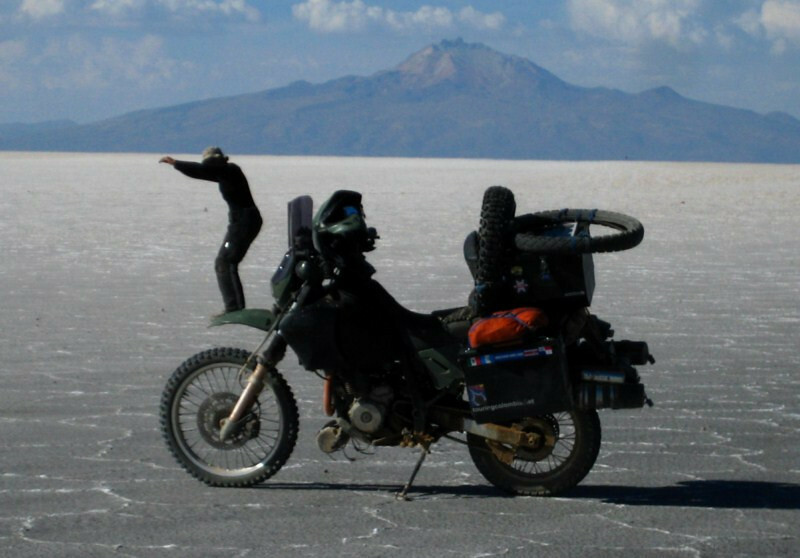 Jumping off the front fender for a dive into the salt lake. 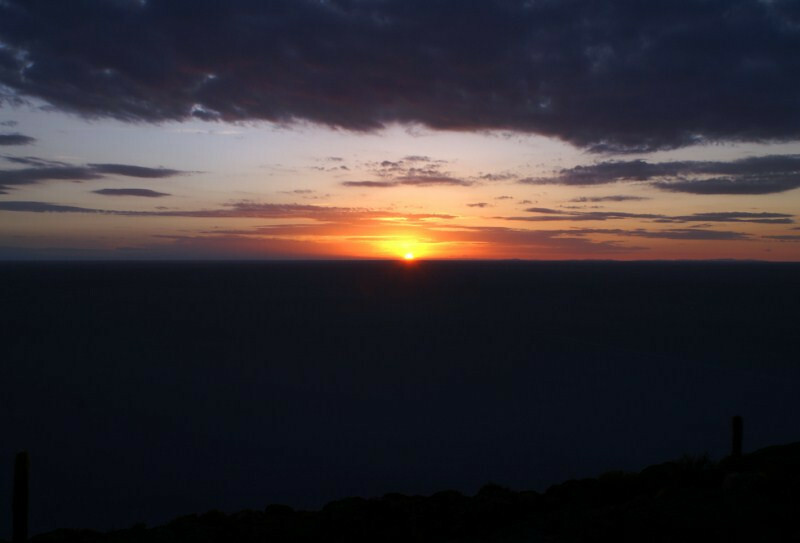 The island is visited by numerous Land Cruisers and can look like a parking lot during the day, but they all go away as the sun dips down. 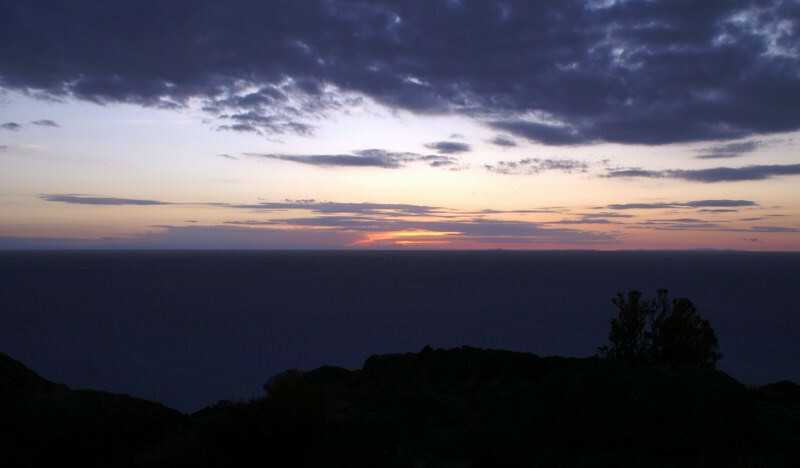 The island itself is a protected area and stepping foot on it requires you to pay B15, which allows you to hike to the top for good views and provides access to bathrooms and a fresh water supply. There are also some hotel rooms, but I was looking forward to camping out. Next to me, Yoshi from Japan pulled up here on his bicycle. He is cycling around the world and has just come down from Vancouver and is heading east across the planet. It’s always reassuring for your sanity to meet someone crazier than you. The surface of the salar is quite rough and can cut skin if you scrape against it. However, the entire 10,582 sq km (4,086 sq mi) of it doesn’t vary by more than one meter, which is all the more remarkable considering its altitude of 3,656 m (11,995 ft). This truly is a special place on this planet and hopefully it doesn’t change much when lithium mining picks up and the brine is drained. 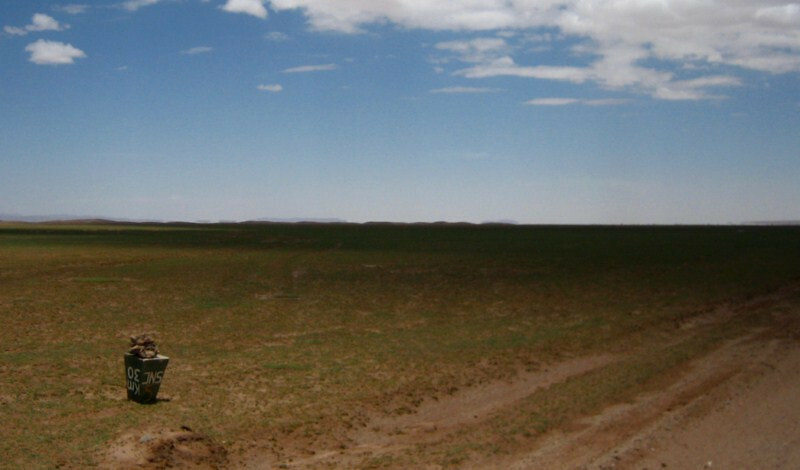 Due to its extreme geologic flatness and high reflectivity (being white), it’s been a good place to calibrate the altimeters of earth observation satellites. The flatness has been attributed to the annual flooding of the salar as the water levels any changes in the topography. 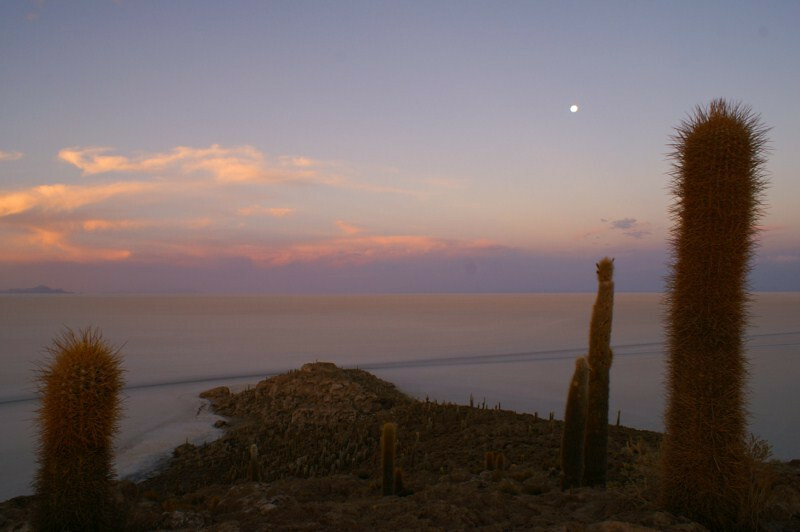 During the rainy season, Lake Titicaca overflows into Lake Poopó and it in turn floods the salars of Coipasa and Uyuni. 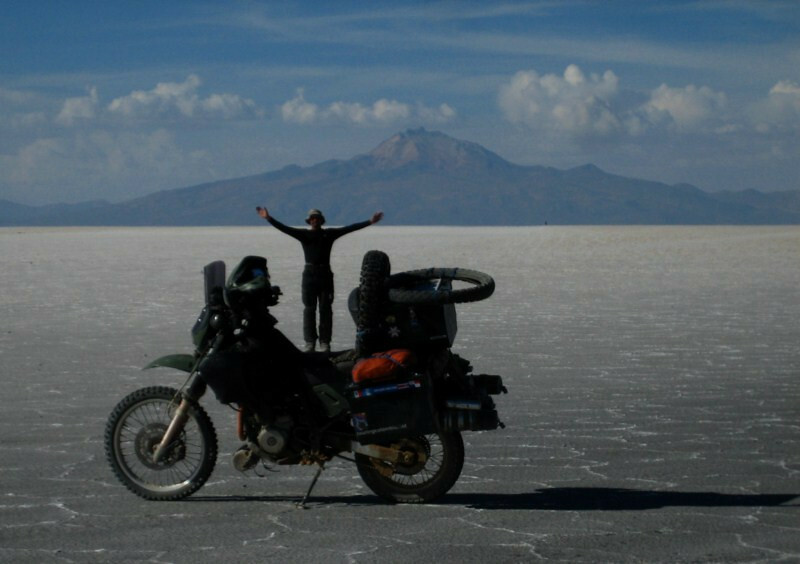 It’s not advisable to ride a metal machine through a salt lake but the views are supposed to be fantastic with the whole surface acting like a giant mirror. After setting up camp, Yoshi and I hiked up to the top to enjoy the sunset. The uniqueness of this place grows with every step. 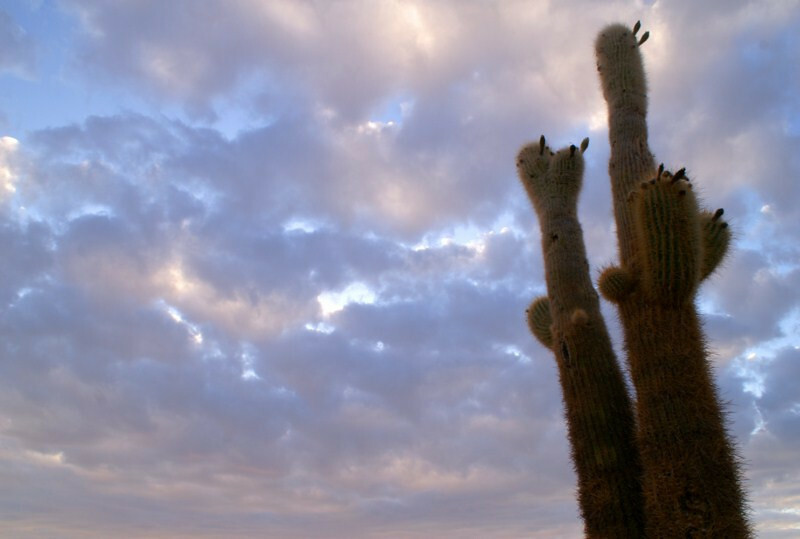 We’re in the middle of a salt falt on an old volcano covered in cactii. Some of them are quite large, sprouting flowers. 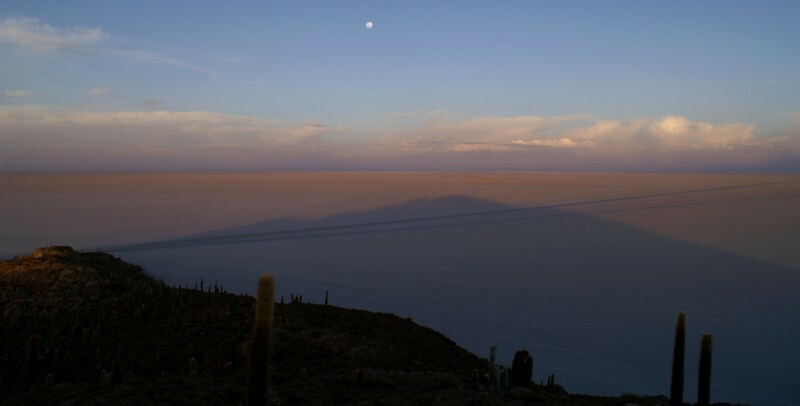 The shadow of Isla Incahuasi growing towards the east as the full moon rises over the track heading to Uyuni. Looking north with tracks heading to Jirere and Volcan Tunupa, a prominent feature on the horizon, which is active. 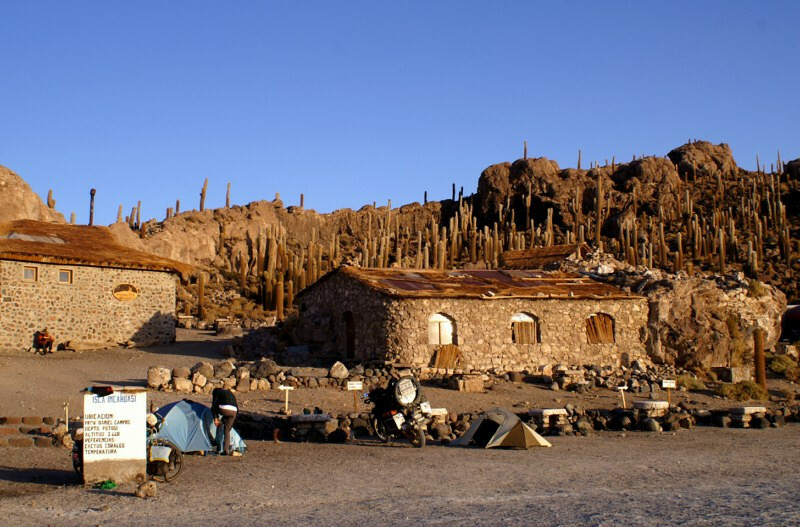 The volcano has importance in local Aymara legends (her tears for a runaway lover volcano mixing with milk created the salar) and they prefer this place to be called Salar de Tunupa rather than Uyuni, which isn’t even on the salar. 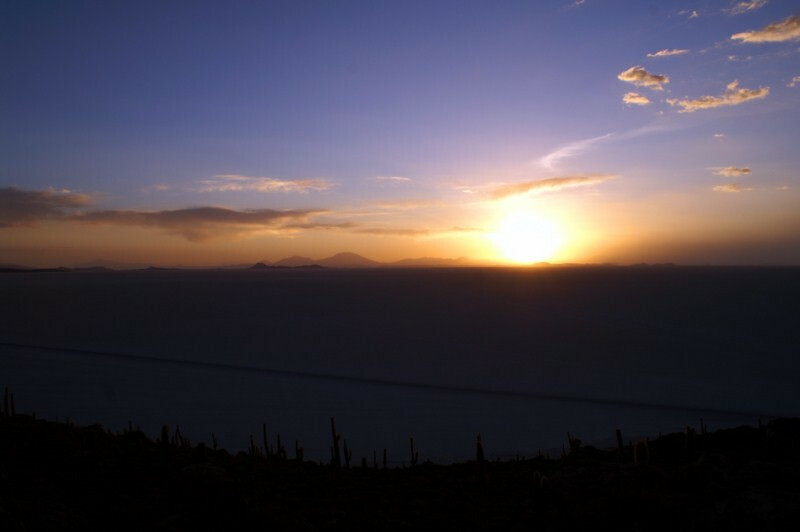 The sun setting over the Salar de Uyuni and with that, the winds picked up and the temperature plummeted. It’s quite comfortable during the day time, but without El Sol, it’s a different place. Looking south to the route I would take tomorrow. I was hoping I could time my trip to the salar with a new moon for the expected super clear night sky, but alas, I was two weeks out of sync with our lunar neighbor and would have a bright moon for the next few nights. Oh well, that is a natural phenomena to enjoy in itself. A natural bridge in the rocks of Isla Incahuasi. Strangely enough (but I guess not surprising anymore), there are two resident llamas on the island. What’re they doing in the middle of a salt desert on an island of cactii? I guess, anything they want. 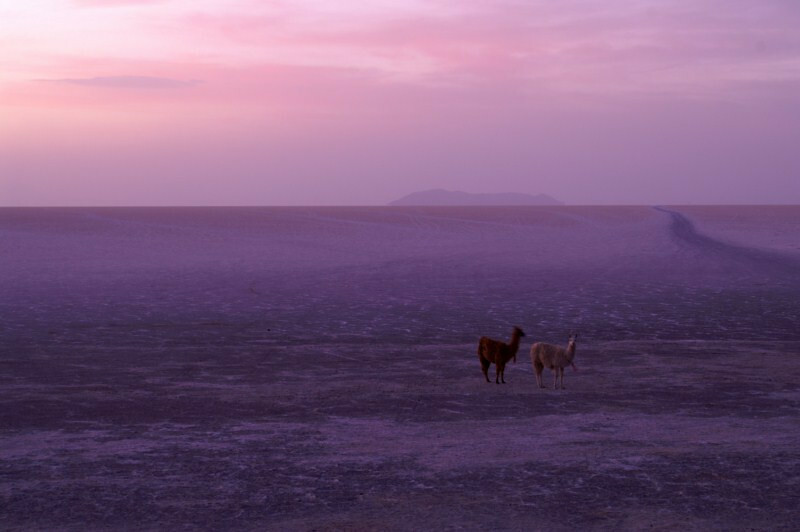 They were running about and playing on the salar like it was their backyard and just then, the skies turned purple briefly with two llamas dancing on salt. Getting ready for a chilly night. It’s summer now but I was still expecting it to get very cold, dropping way below freezing and thus I put my sleeping bag liner inside my summer sleeping bag and put that inside the newly acquired down sleeping bag. In addition, I wore quite a few layers including wool socks, neck gaitor and fleece beanie (winter cap). After some dinner of ramen with tuna, which we ate outside, but did so quickly as the cold wind was sucking our warmth away, we tucked in for the night. However, around 11pm, the wind suddenly stopped and after a quick peek outside and seeing the brilliance of the full moon on the salar, I took this picture with my old Konica Minolta 5D SLR, which is a 3 minute exposure. 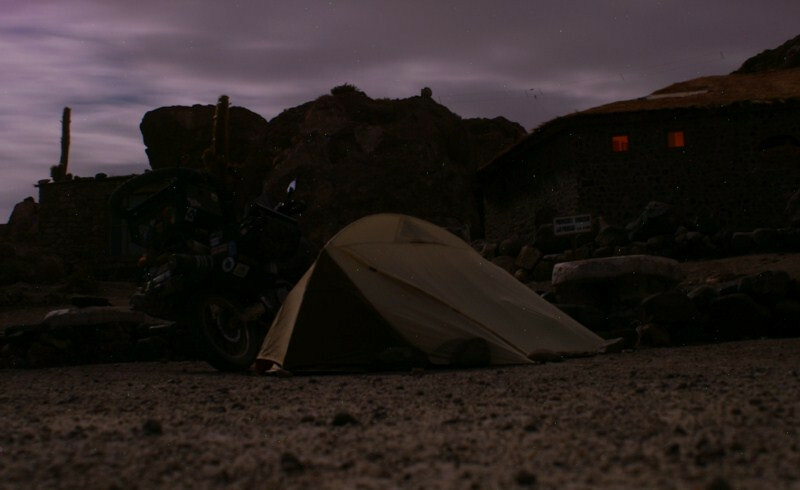 You can see the rocks that I laid against the tent wall to seal it to the ground as my tent is primarily for hot weather and the roof doesn’t seal to the floor. 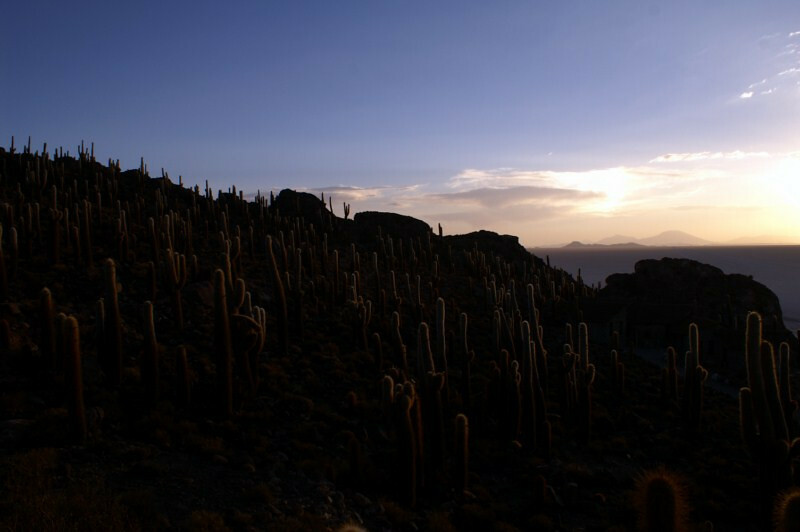 Getting up at 6 am for sunrise from the top of Incahuasi. The temperature didn’t drop as low as I was expecting and I was actually a bit warm. The darkness of night peeling back to the returning Sun. The moment of daybreak. The winds were howling and quickly died down as if bowing down to the mighty heating power of this parent sun. 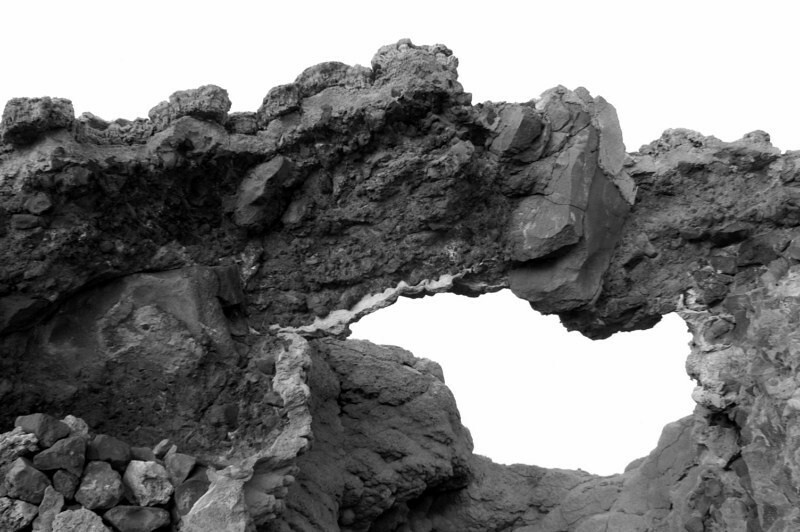 The strange coral-like structures that the island is made of. A relic from the days when this volcano was engulfed by the ancient lakes of the Pleistocene era. Enjoying the effects of the new sun on the cactus island. Dried salt after going through a heavily-rutted area that was filled with saline solution near the entrance to the salar as I looked for the correct track. I scrapped off most of it. Saying good-bye to Yoshi. 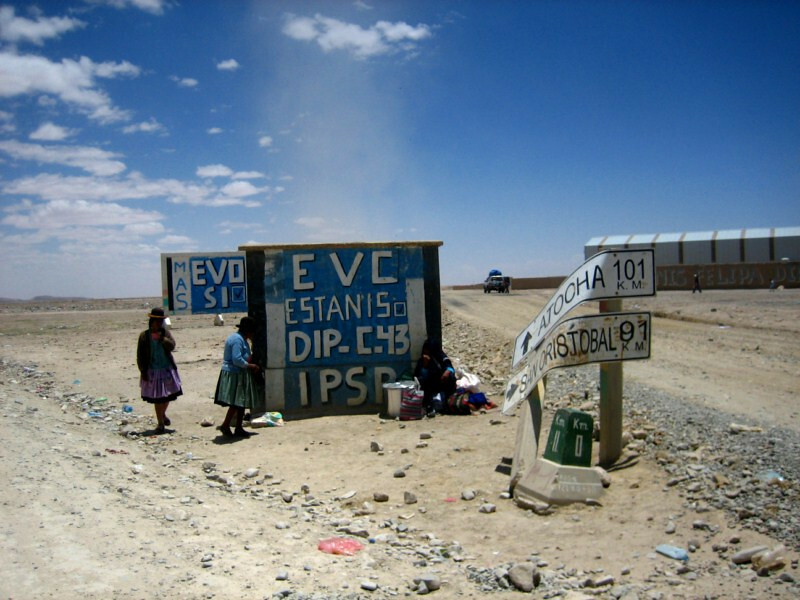 He was heading to Uyuni and onwards to Potosi. 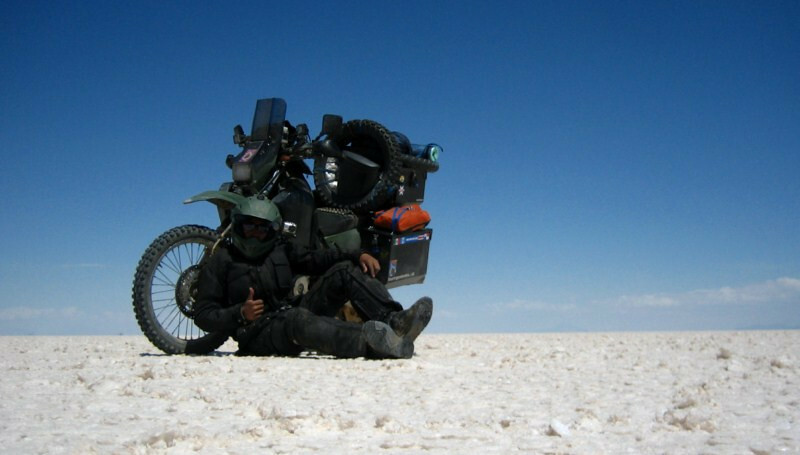 Before setting off on his travels, he worked at a Toyota factory back in their home city of Nagoya and is actually a motorcyclist more than a bicyclist and is a part of various moto clubs. He’s built a cafe racer from an old Yamaha RD400. 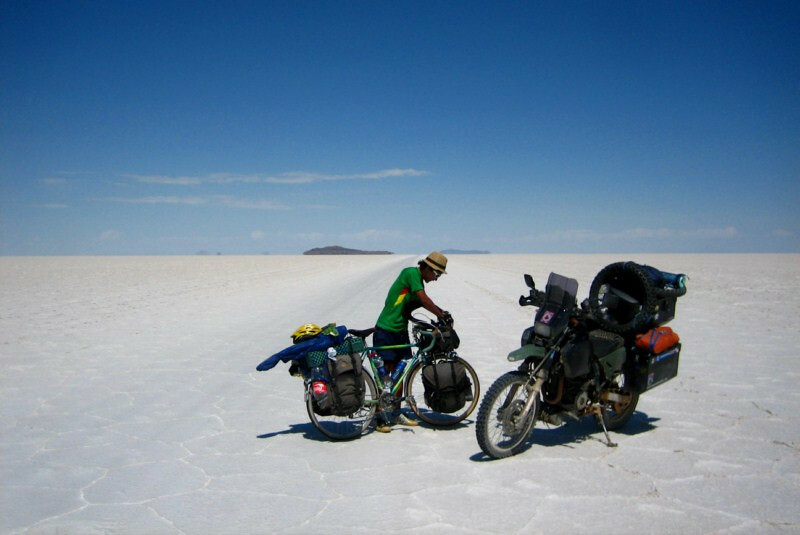 He actually wanted to travel by motorcycle (of course), but his worries about finding enough spare parts and the cost of maintaining a bike led him one step further down the minimalist path to pedal power. He actually said he didn’t enjoy pedaling for so many days in a row and I chuckled as I reminded him of the three years that lay ahead for him. You can only second-guess yourself, so much. I see the appeal of traveling by bicycle, not burning any fossil fuels, but you obviously need a lot more time to cover the same distance. After probing me about the maintenance I had done to sanDRina and happy to see such an old bike performing so hardily, I planted the seed in this bicyclist to come back to the motorcyclist world. He had given me his diary to write something in there for him to read later and forgot the book as he took off. I got ready and went after him and was impressed to see he had done 7 kms in 30 minutes. 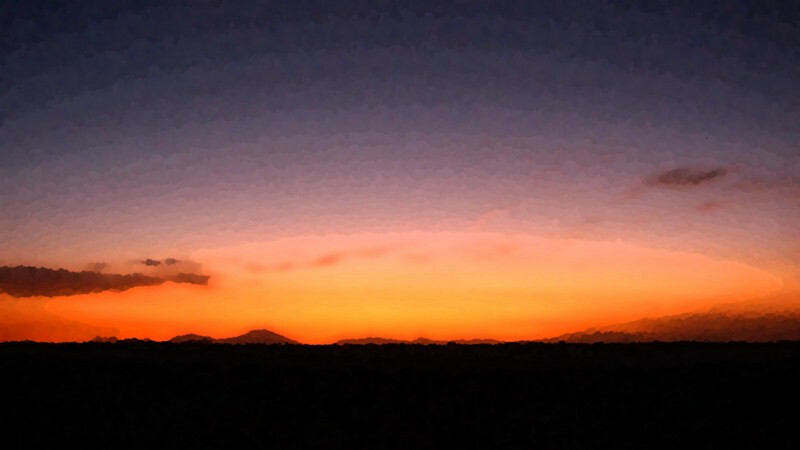 It was a strange experience searching for a moving object on the horizon in this blinding landscape. He was on a parallel track and as I veered towards him, I could see his wheels turning, but it didn’t look like he was moving. He was happy to have his diary back as all his thoughts from the past few months have been captured in it. I turned south and looked for the exit that all the tracks pointed to. 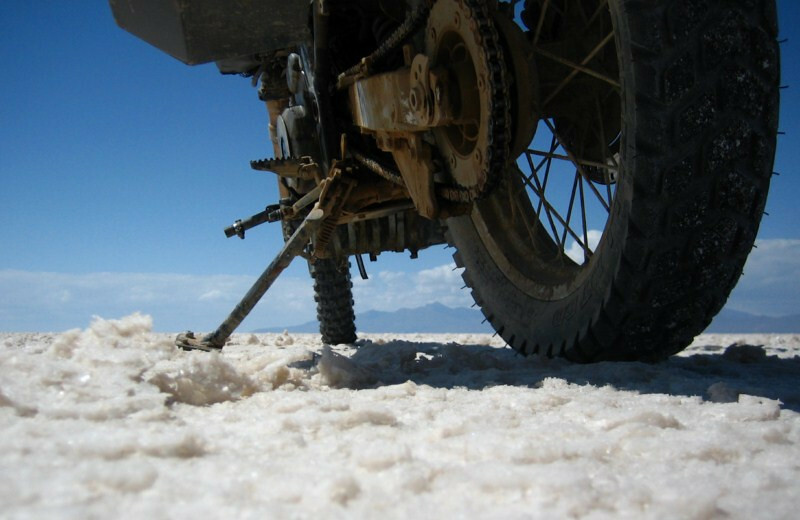 Knobby tires are not needed on the salt and I wore them down by riding fast on the rough surface. But, they would be much appreciated on the terrain coming up. Woot! 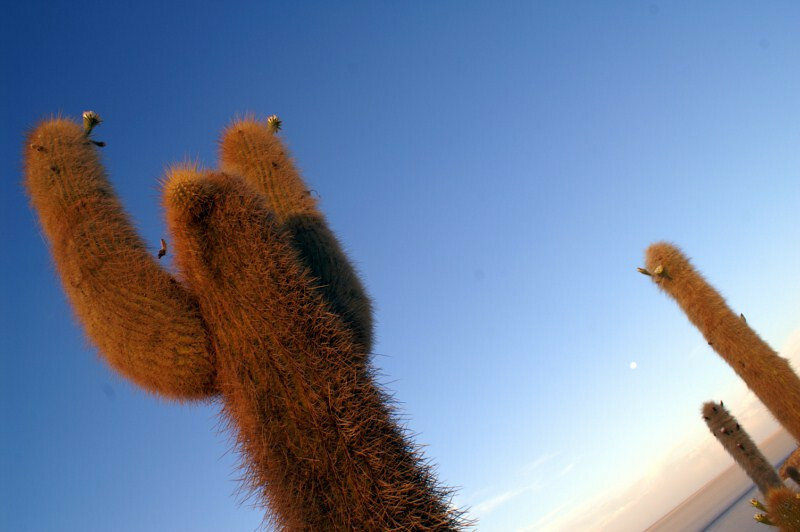 to an awesome experience on the Salar de Uyuni. It might be getting more touristy all the time, but that doesn’t take away from why this place is so impressive. A glamour shot of sanDRina on the brilliant salar.